Nope! This bunny has all of her puzzle pieces in order. "I was trying to make some butter, but I think I made mayonnaise instead." 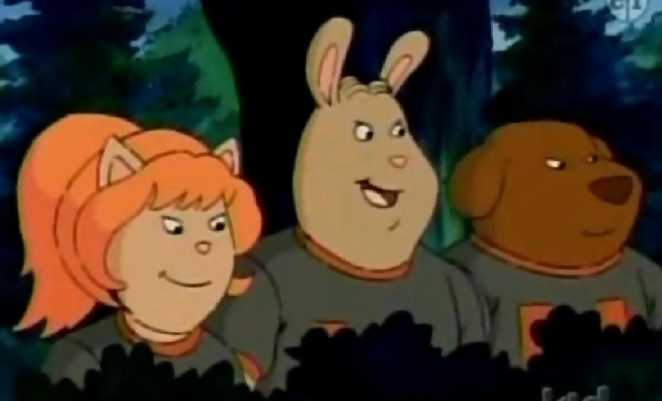 "Binky, how rude. Can't you see I'm shouting?" "Have you ever realized how frighteningly easy it is to manipulate someone into doing whatever you want?" "I brought a label-maker. What needs identifying?" YES! YES! The bunny is guessed! I know the quality's a little grainy on this one, but it'll suffice for identification purposes. YES! Looks like poor Harry lasted about as long as a candidate as he did under Bitzi's covers. The park ranger who gave Mr. Ratburn's class the cave tour in "The Cave"? Looks like that one rabbit guy from Camp Horsewater. ..so, is that a 'yes' ? lol, sorry I don't know is name. From "Arthur Goes to Camp". 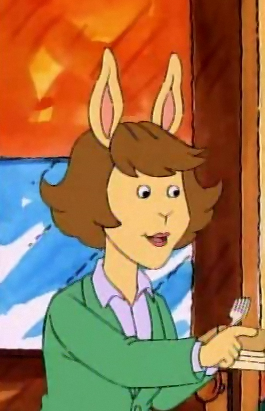 Since he's the only male rabbit at Camp Horsewater in that episode, I think it's safe to say that you've got this one. Of course, we all know him as none other than...BUNNANAMAN!